1Price includes all rebates incentives and dealer discount. May or may not include additional incentive to finance with GM Financial. Tax, title, license and dealer fees(unless itemized above) are extra. Not available with special finance or lease offers. Price is subject to change any time at dealer discretion. Contact dealer for details. Courtesy Broussard Chevrolet and Cadillac is a Lafayette, Baton Rouge, Lake Charles, Alexandria, and New Orleans supporting dealer. Tax, title, license (unless itemized above) are extra. Not available with special finance, lease and some other offers.Not available with special finance or lease offers. Take delivery by 04-01-2019. 2- ONLY 2005 OR NEWER NON-GM PASSENGER CAR OR TRUCK OWNERS/LESSEES ARE ELIGIBLE FOR THIS INCENTIVE. - CUSTOMER IS NOT REQUIRED TO TRADE IN THEIR QUALIFYING VEHICLE. - THIS OFFER CAN BE TRANSFERRED TO INDIVIDUALS RESIDING IN THE SAME HOUSEHOLD. BOTH THE TRANSFEROR'S (ORIGINAL INTENDED CUSTOMER) AND TRANSFEREE'S RESIDENCY MUST BE VERIFIED WITH CURRENT DRIVER'S LICENSE OR STATE IDENTIFICATION. - APPROPRIATE PROOF WOULD INCLUDE A COPY OF CURRENT LEASE CONTRACT, TITLE, VEHICLE REGISTRATION ONLY IF THE CUSTOMER'S NAME AND ADDRESS APPEAR ON THE REGISTRATION) OR A PAYMENT COUPON IN THE CUSTOMER'S NAME. IF REGISTRATION DOES NOT INCLUDE THE CUSTOMER'S NAME AND ADDRESS, A COMBINATION OF THE REGISTRATION AND PROOF OF INSURANCE WITH THE CUSTOMER'S NAME AND ADDRESS IS ALSO ACCEPTABLE. SCREEN PRINTS FROM STATE DMV/SECRETARY OF STATE OR EQUIVALENT WEBSITES ARE ALSO ACCEPTABLE IF THEY SHOW CLEARLY THAT THE CUSTOMER CURRENTLY OWNS OR IS LEASING A QUALIFYING VEHICLE. - IF TRANSFERRED TO AN INDIVIDUAL RESIDING IN THE SAME HOUSEHOLD, PROOF OF ELIGIBILITY ALONG WITH PROOF OF RESIDENCY (DRIVER'S LICENSE OR STATE IDENTIFICATION) FOR THE TRANSFEROR (ORIGINAL INTENDED CUSTOMER) AND TRANSFEREE MUST BE RETAINED IN THE DEAL JACKET. Offer expires 04-30-2019 3Price includes all rebates incentives and dealer discount. May or may not include additional incentive to finance with GM Financial. Tax, title, license and dealer fees(unless itemized above) are extra. Not available with special finance or lease offers. Price is subject to change any time at dealer discretion. Contact dealer for details. Courtesy Broussard Chevrolet and Cadillac is a Lafayette, Baton Rouge, Lake Charles, Alexandria, and New Orleans supporting dealer. Tax, title, license (unless itemized above) are extra. Not available with special finance, lease and some other offers.Not available with special finance or lease offers. Take delivery by 04-01-2019. 4Excludes L models. Monthly payment is $13.89 for every $1,000 you finance. Example down payment: 5.2%. Must finance with GM Financial. Some customers may not qualify. Not available with lease and some other offers. Take new retail delivery by 4/30/2019. See dealer for details. 1Price includes all rebates incentives and dealer discount. May or may not include additional incentive to finance with GM Financial. Tax, title, license and dealer fees(unless itemized above) are extra. Not available with special finance or lease offers. Price is subject to change any time at dealer discretion. Contact dealer for details. Courtesy Broussard Chevrolet and Cadillac is a Lafayette, Baton Rouge, Lake Charles, Alexandria, and New Orleans supporting dealer. Tax, title, license (unless itemized above) are extra. Not available with special finance, lease and some other offers.Not available with special finance or lease offers. Take delivery by 04-01-2019. 2- ONLY 2005 OR NEWER NON-GM PASSENGER CAR OR TRUCK OWNERS/LESSEES ARE ELIGIBLE FOR THIS INCENTIVE. - CUSTOMER IS NOT REQUIRED TO TRADE IN THEIR QUALIFYING VEHICLE. - THIS OFFER CAN BE TRANSFERRED TO INDIVIDUALS RESIDING IN THE SAME HOUSEHOLD. BOTH THE TRANSFEROR'S (ORIGINAL INTENDED CUSTOMER) AND TRANSFEREE'S RESIDENCY MUST BE VERIFIED WITH CURRENT DRIVER'S LICENSE OR STATE IDENTIFICATION. - APPROPRIATE PROOF WOULD INCLUDE A COPY OF CURRENT LEASE CONTRACT, TITLE, VEHICLE REGISTRATION ONLY IF THE CUSTOMER'S NAME AND ADDRESS APPEAR ON THE REGISTRATION) OR A PAYMENT COUPON IN THE CUSTOMER'S NAME. IF REGISTRATION DOES NOT INCLUDE THE CUSTOMER'S NAME AND ADDRESS, A COMBINATION OF THE REGISTRATION AND PROOF OF INSURANCE WITH THE CUSTOMER'S NAME AND ADDRESS IS ALSO ACCEPTABLE. SCREEN PRINTS FROM STATE DMV/SECRETARY OF STATE OR EQUIVALENT WEBSITES ARE ALSO ACCEPTABLE IF THEY SHOW CLEARLY THAT THE CUSTOMER CURRENTLY OWNS OR IS LEASING A QUALIFYING VEHICLE. - IF TRANSFERRED TO AN INDIVIDUAL RESIDING IN THE SAME HOUSEHOLD, PROOF OF ELIGIBILITY ALONG WITH PROOF OF RESIDENCY (DRIVER'S LICENSE OR STATE IDENTIFICATION) FOR THE TRANSFEROR (ORIGINAL INTENDED CUSTOMER) AND TRANSFEREE MUST BE RETAINED IN THE DEAL JACKET. Offer expires 04-30-2019 3Excludes L models. Monthly payment is $13.89 for every $1,000 you finance. Example down payment: 5.2%. Must finance with GM Financial. Some customers may not qualify. Not available with lease and some other offers. Take new retail delivery by 4/30/2019. See dealer for details. •	The Chevy Equinox is a small SUV that is fun to drive and fuel-efficient. •	You will save money at the pump with the Chevy Equinox’s estimated 40 MPG on the open road. •	It has a variety of innovative safety features like low-speed forward automatic braking and a rear vision camera to help you prevent collisions. •	Tech aficionados enjoy the capability to connect up to seven devices to built-in Wi-Fi. •	You can select from three different engines with up to 252hp so you can get the power you need. •	With up to 63.5 cu. ft. of storage and seats for up to five passengers, the Chevy Equinox has space for you, your family, and all of your things. Search our inventory of new Chevy Equinox vehicles in Broussard and decide on the color and options that are best for you. Also be sure to check out our special offers on the Chevy Equinox. 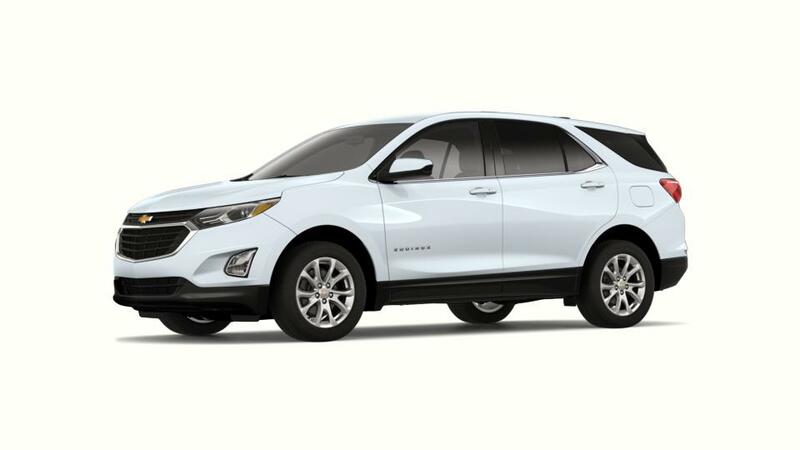 Call us at 337-446-2269 with any questions you have about test driving an Chevy Equinox..